A comic is the last thing that comes to one's mind while looking for a tool to help understand a new and complex tax law like Goods and Services Tax (GST). But the same has been made possible by the Author Mr. Srinivas Kotni in his book titled- "Adventures of the GST Man". 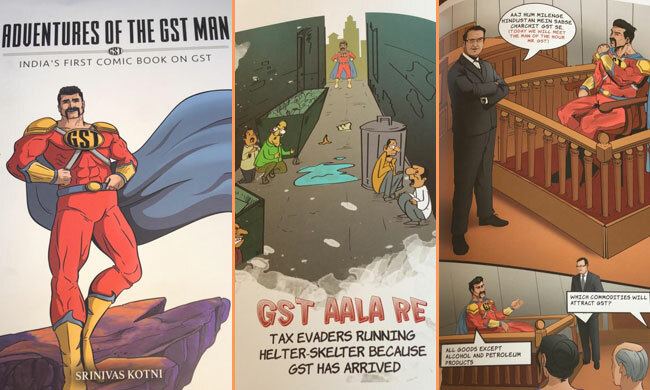 The idea of presenting a bird's eye view of the Law through a superhero called GST is quite innovative and very interesting. The Author Mr. Srinivas Kotni is Managing Partner of law firm and also a Company Secretary with professional experience of about 24 years in Tax Laws. As an old friend I have witnessed the authors professional journey, which appears to coincide with the development of Indirect Tax laws in the Country. Starting from Customs & Central Excise Laws, he happened to witness the introduction of MODVAT and later, CENVAT and eventually VAT. The culmination of the tax reforms is the present GST, which has subsumed broadly the entire gamut of indirect tax laws. The Foreword to this book is written by the Finance Minister, who has introduced GST. In fact the Superhero reminds us of a Wing Commander of the Indian Air Force who was in news in recent times. But the fact that the Foreword was written in October 2018, shows at best it was the premonition of the Cartoonist as to how a national hero would look like! The Contents page of the book retains the flavor of a comic book wherein each story is given a unique comic like name, such as 'Welcome The Saviour', 'GST, Assess and Navigate', 'The Refund Story', 'The Demand Drill' and 'The incredible Invoice System'. In all, the entire subject is divided into 33 stories. The contents page gives it the feel of a comic, while the index towards the end gives a professional relief as it takes you straight to the topic of interest. A perusal of the book gives the reader a brief history of the legislation from its conception in the year 2006 till it was brought into force in July 2017. Being in a comic format the author seems to have taken liberties to reflect on the political fallout by the introduction of GST as well. In a serious commentary it may not be relevant but in this format may be it can be passed off as creative freedom of the author. While dealing with various practical issues which the businesses and traders faced, the role of GST council have been very succinctly presented through characters . All aspects of the law from the charging provisions, various assessees, procedural compliance and FAQs have been dealt with in this comic in a dialogue format between various stakeholders and the Superhero. The substantive provisions including the distinction between Central GST(CGST), State GST(SGST) are explained in an easy to understand manner. The various statutory forms required to be submitted by each of the supplier in the value chain and the manner of taking input credit and reconciliation of various returns to be filed for ensuring there is no revenue leakage is very nicely explained. Brief outline of various types of assessments, Refund procedure and Demand is etched in separate stories. In fact the story on Demand Drill explains the scope of Demand under Section 73, where there is no fraud involved, while Section 74 is applicable where fraud, suppression, mis-statement etc. is involved. Those covered under Section 73 is called the Good Boy, while those covered under Section 74 is called the Bad Boy. In a very crisp manner the scope of both proceedings have been explained with reference to the period of limitation being 3 years in cases covered under Section 73 while it is 5 years in cases under section 74. On Payment of Tax with interest within 30 days of Show cause notice in cases under Section 73 no penalty is payable and proceedings conclude automatically. While in the case of Section 74 the Bad Boy has to pay Tax with interest and 15% of tax as penalty. The story on Surprise Visit deals with concepts of non-availability of input tax as also on Anti-Profiteering in a very brief manner, though a few more illustrations herein would have helped the reader to understand the concepts much better. Implications of GST on various players and procedure for cancellation of registrations are dealt with deftness. Last but not the least references are also made to Advance Payments, Cross Utilization of GST etc. The book seems to achieve its object of reaching out to a larger audience and making law accessible in a comic format for all to get interested and also understand the broad parameters. It goes without saying that it can be a good book to introduce GST for one and all, but does not eliminate the need of more extensive analysis on the various complex concepts and issues involved. Overall a very creative concept which has been executed befitting the concept in a very rich format which is very soothing to hold and read. A serious advice, don't judge the book by its cover and expect a non-serious work. This book makes the grade for a authoritative introduction to GST for all, students, businessmen, and Professionals.